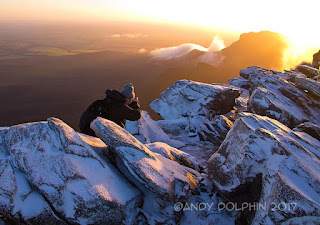 Just shy of 1100m high, Bluff Knoll is the highest peak in southern Western Australia and, as such, is the only place in Western Australia where snow is likely to fall every year. 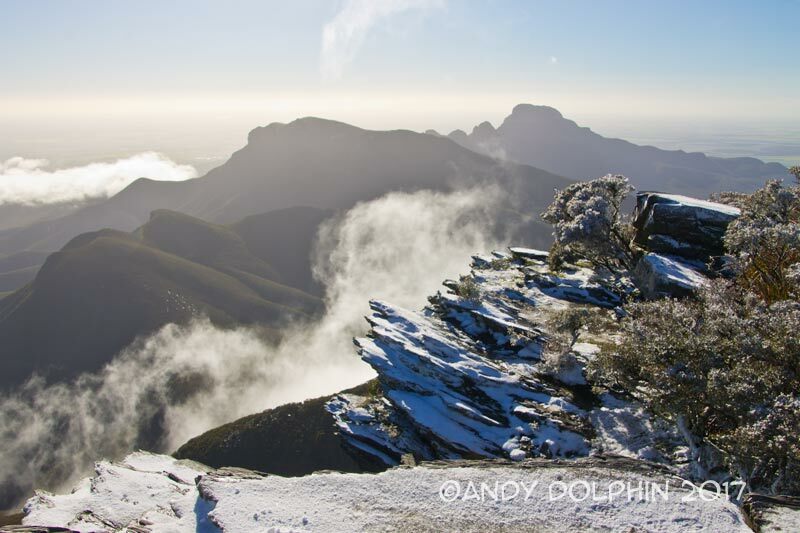 But, even on Bluff Knoll, snow is not exactly a common occurrence so when it does fall, it is something of an event and can result in traffic chaos. Last year my son and I started doing some of the mountain hikes in our region and I also took an interest in reading weather charts in an attempt to predict snow. Last week those two pursuits came together and we hiked to the top of Bluff Knoll to encounter a spectacular (by Western Australian standards) snow-covered landscape. 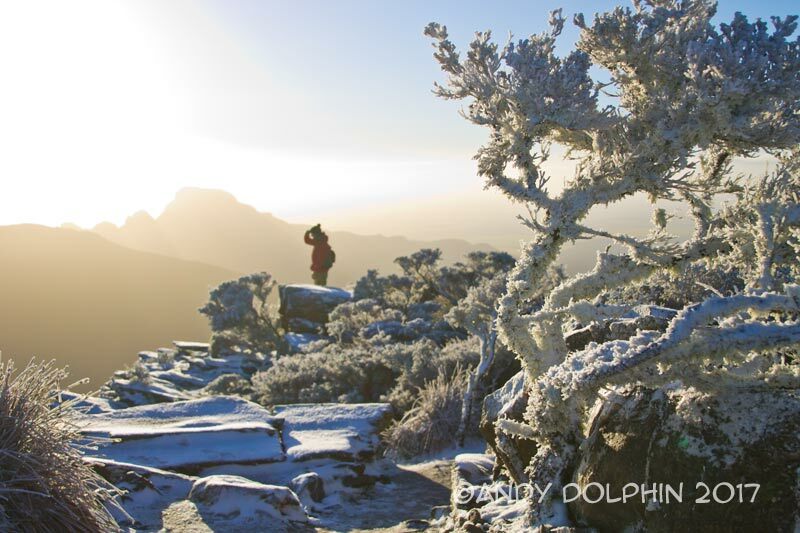 We woke at 2am, left home around 3am and arrived at a surprisingly empty Bluff Knoll car park almost an hour later. We began the 3km hike up the mountain around 4am, three hours before sunrise. Luckily, the moon was almost full and the sky was clear so we had pretty good visibility, even when we turned our torches off. Once we exited the bush-land part of the walk and traversed the steady incline above the main treeline, we could see the mountain range for kilometres to the west although sunrise was still two hours away. It was a slow, steady walk - made slower by me overheating twice. Last Thursday morning was predicted to be one of the coldest mornings of the year and I was expecting wet, blustery weather - indeed there had been significant rainfall overnight - but morning on the mountain was clear and still. There was barely any breeze at all, so my five layers of clothing, plus ski gloves, very quickly turned out to be two layers of clothing and two gloves too many. With that problem sorted, after two stops to shed layers and re-compose myself, we enjoyed a steady walk toward the summit. By this stage, we had given up on any hope of seeing snow - it was far too pleasant. We were now just hoping to catch a nice sunrise from the top. Near the 2km mark, we were overtaken by a reporter carrying a snowboard and after I wished him luck, he pointed to the snow at our feet. We hadn't noticed it in the dark. From here on the snow increased almost exponentially every 20m or so, until it seemed like every surface, including every branch of every shrub, was caked in snow and ice. There wasn't nearly enough snow - or space - to truly accommodate a snow board, but the reporter was just providing a bit of humorous media fodder. The vista of snow slowed our walk still further as we stopped repeatedly to take photos in the pre-sunrise twilight. We eventually reached the top of the mountain just after sunrise and were greeted with the astonishing sight of the distant eastern ridge silhouetted against an orange sky with pink-orange sunlight streaming across the snow-covered foreground. It was sublime. It was magical. It was, quite literally, a winter wonderland. And, if I am to work a painting angle into this story at all, let me say it provided a wonderful lesson in warm lights and cool shadows as it was difficult not to notice the orange-blue complements. The best thing about this trip was that we were two of just a dozen or so people at the top. A month earlier, with snow predictions broadcast widely across social and mainstream media, hundreds of people converged to make the trek, resulting in access being restricted for most of the day by national park rangers. But the best thing about this trip was the perfect weather. The throngs who battled the trek in July endured stormy, blizzard-like conditions with some snow flurries, but no snow on the ground. But the best thing about this trip was that, although no snow fell for us, we saw possibly some of the best snow coverage this mountain ever enjoys. But the best thing about this trip was that a quokka made an appearance at the top. Yep, I think that was definitely the icing on the cake - a quokka, on top of a mountain, in the snow. My son took a bunch of photos of it and, if you haven't already seen that story splashed all over the media, then I imagine a quick search will find it for you. Please note, all images are copyright. Please do not re-publish without permission. Thanks.